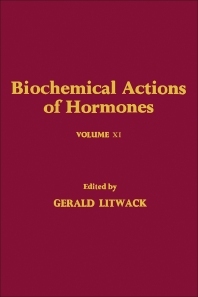 Biochemical Actions of Hormones, Volume XI is a 12-chapter text that covers the general and specific biochemical aspects of polypeptide and steroid hormones. The introductory chapters deal with the biochemical actions of the leukotrienes, the cyclic adenosine monophosphate, and the gonadotropin releasing hormone. The next chapters highlight detailed contributions on polypeptide hormone research. These chapters specifically tackle the insulin actions and the role of insulin in mammary gland development. The last series of chapters on steroid hormones includes X-ray crystallographic analysis of steroid structures and the significance of these studies on steroid-receptor interactions. These chapters also explore the analysis of the estrogen receptor with monoclonal antibodies; the role of estrogen receptor in responsive mammalian cells; the use of peroxidase as a marker of catechol estrogen action; and the activation and stabilization of the glucocorticoid receptor. This volume will be of great benefit to biochemists, biologists, endocrinologists, and researchers who are interested in the hormonal action and regulation. Dr. Litwack is an accomplished and prolific author and editor at Elsevier. Spanning over 25 years, he has been the editor of over 55 volumes of Vitamins and Hormones, co-author of Hormones, editor of 14 volumes of Biochemical Actions of Hormones, co-editor of Actions of Hormones on Molecular Processes, author of Human Biochemistry and Disease, and just wrapping up Human Biochemistry. He also authored Experimental Biochemistry [Wiley] and edited Receptor Purification, 2 volumes [Humana]. He is an author on over 300 journal articles and has been on the editorial boards of numerous journals, including Endocrinology, Oncology Research, Oncology Reports, Journal of Molecular Biochemistry, Chemtracts, Cancer Research, Apoptosis, and Critical Reviews in Eukaryotic Gene Expression.